At DrMiller.com our purpose is to enable students, patients, clients and customers to succeed physically, mentally, emotionally, and spiritually, through the use of self-empowering mind-body tools, such as deep relaxation, meditation, guided imagery, self-hypnosis, and personal/spiritual growth. DrMiller.com is more than a source of information on achieving health and well-being. It is literally the culmination of the life work of a respected leader in the mind-body medicine field —Emmett Miller, MD. Through articles, interviews, videos and more, he shares his knowledge and experience to enable you to understand and use the techniques of self-healing, peak performance, and personal and collective transformation. 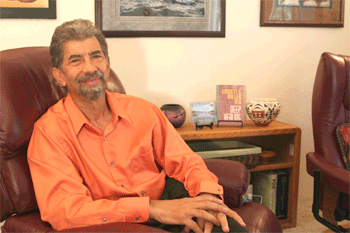 Meet Dr. Miller and learn more about his contributions to the field of Mind-Body Medicine. Some 40 years ago I realized that the most powerful tool for healing was the mind-body connection and it was being ignored by the Healthcare System. It then became my professional mission to introduce the psychobiosocial approach into the field of medicine and psychology. To this end I endeavor to become a trusted source of knowledge and wisdom in the healing field, and commit to create quality self-healing tools and products for individuals and professionals to use for the healing of the mind and the body. Listen to this clip from Healing Journey, the program that awakened the world to the power of Deep Relaxation and Guided Imagery, healing imagery from Healing Journey. My studies in medicine demonstrated to me that the majority of our illnesses are due to a lack of appropriate information and the resulting maladaptive functioning of the mind. A tiny bit of information can be incredibly important—like knowing which way to turn your wheels if you begin to skid on ice. Or knowing the combination to a safe. Or how to provide deep relaxation as a direct antidote to stress. Information can save your life and make it immensely better. But only some information is knowledge and only some knowledge is wisdom. Now, in a world drowning in information, it is my mission to help discern what information is wise to pursue. Here at DrMiller.com you will find information that is not only intellectually stimulating but also scientifically sound and experientially effective. Our goal is to bring you wise guidance and a direct experience of healing, assist you in achieving wellness, and enabling you to perform at your peak. Here is an example of one of the Heart to Heart talks from Abolish Anxiety, demonstrating the honest, logical, evidence-based approach I take: What is Anxiety. “Nothing great,” Ralph Waldo Emerson tells us, “was ever accomplished without enthusiasm.” Whether your goal is to heal yourself or your relationships, or to find and follow your unique path in life, inspiration is crucial to your success. The natural state of every human being is joyful, curious, creative, and enthusiastic. Such qualities are a direct reflection of our inner spirit, the Life Force. The luxuriant abundance of living things on this planet attests to the power of this force. But when this inner light is dimmed, our natural creativity, ebullience, and loving nature diminish, and instead, depression, anxiety, and rage result. To be inspired is to breathe this spirit into your body, mind, emotions and performance. Our Mind Tools here on DrMiller.com will help you to empty yourself of excess tension and negativity, and then help guide you to tap into your deepest inspiration that is your essence. Enjoy this segment from Permanent Weight Loss as you imagine communicating with your deeper mind: Creating Motivation and Inspiration. I have always believed in the Roman Rule, “Those who do not believe a thing can be done should get out of the way of those who are doing it.” We are doing it at DrMiller.com where we offer exciting new ideas and tools to help facilitate transformations for you, your family, your community and our planet. It is not transformation when the caterpillar grows fatter by eating more, but when, within its cocoon, it metamorphoses to a butterfly… now that's transformation! Being promoted from the mailroom to the stock room is not transformation—although it is a promotion. To become a successful inventor or a bestselling author is transformation. To have a little less pain or a little less anxiety is good, but a true healing involves transformation, going beyond pain-free to vital and healthy: A journey beyond anxious to safe, strong, enthusiastic, and joyful. On DrMiller.com you will find Software for the Mind® that is not only effective for helping you relieve symptoms, but will also encourage Deep Healing, a stronger self-esteem and an inspired life transformation. See if you can use this clip from Awakening The Leader Within to visualize the future you want to create and envision your desired future.